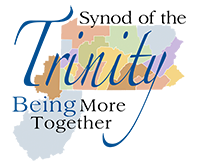 We celebrate the submission of a grant to the Lilly Foundation on behalf of the Synod of the Trinity, a grant responding to Lilly’s Thriving in Ministry emphasis! Within the Synod of the Trinity, both pastors and congregations are adapting to new realities in discerning, defining and living out healthy ministry. Pastors struggle with the changing expectations in this environment… Through this (Re)Call Initiative, pastoral practices and conditions that establish the norms for healthy ministry among us will be shaped for flourishing. Additionally, we envision presbytery and congregational connection to be an important part of this initiative. Many, many thanks to the team who prepared the grant: Martin Ankrum, Dana Sutton and Nick Marlatt from the New Pastors Advisory Team and Skip Noftzger, whose grant writing expertise was key to developing and completing the application. Susan Wonderland served with the team representing the Synod staff. In January, a New Pastors Advisory Team came together and began to wrestle with what might be needed and wanted now in our region for new pastors. This task group had emerged following conversations at the first set of Regional Gatherings in 2016 and around various leadership tables, including the Synod’s Executive Forum. After the January meeting, a Lilly Grant opportunity was discovered, and a small task group was created to work with the possibilities of the grant. The subsequent Lilly Grant request targets new pastors and other pastoral leaders. Some of the pieces relevant to their work will now be kicked back to the New Pastors Advisory Team for consideration and development. This is exactly the kind of listening and discernment that we hope for as we seek vision and partnership across the Synod! We anticipate a rollout of the (Re)Call Initiative in early 2019 and are planning to go forward with a version of the program with or without the grant.